Stop. Stop badgering yourself right now. You are so much braver than you think you are. You’re strong for beginning this journey to discover the truth of your upbringing, to stop living with someone else’s road map in your hands, and to begin seeking the heart of who God knows you to be. Yes, you’re tired and scared and unsure of your way through the murkiness. Sometimes, you question yourself and cry. You want emotional healing immediately. All those feelings are totally normal. But be patient with yourself. You’re getting stronger with each step deeper into your journey about the truth of all the emotional abuse you endured and growing one step closer every day toward emotional healing. Greater strength and patience with yourself will come in time. Steady on. Be kind to yourself. But remember: Do not compare yourself to other people. Survivors of emotional child abuse didn’t start at the same place other people did. Unabused people begin life with selfless love, support, and kindness from good parents. They receive so much more in their upbringing, and so their journey is far more different from an adult survivor knows. You can’t understand their path because yours is nothing like that. Your parents chose to deprive or neglect you of the basics. God didn’t want you to be emotionally abused, but because He allows free will, your parents chose to put a manacle on you and keep you in the swampland of emotional child abuse. But you haven’t stayed there! You’re here now, reading and thinking and reflecting about what you endured and trying to move toward a healthier present and far better future. How amazing you are to get out of that deplorable swampland. How brave to fight for your authentic self. Adult survivors of emotional child abuse have a tough road. We struggle with so many issues of trust, boundaries, self-esteem, and so much more. We’re all a bit broken and wounded. So why compare yourself to others who haven’t been broken so badly? Instead, compare yourself today with who you were just a little while ago. Realize that you have courage. You’re standing here, despite your parents’ flat-out war on your personhood. That is a HUGE accomplishment, my friends. 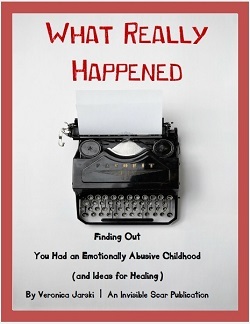 To survive an emotionally abusive childhood is to survive a war. Scarred, battered, hurt, and a little jittery? Sure. But that can be understood and helped through therapy and prayer. Keep moving forward and head out of the swampland. Thank you for this. This is just what I needed to hear. Bless you. Thank you for having the courage to speak out and support us survivors. I treasure these posts. I know that I am not alone although the path seems lonely. God’s timing! I needed this today. Thank you. I know that most of all, I’ve been lucky. Not everybody is. Thank you so much for your wonderful insight. This journey started last year from a comment from a cousin at a family reunion. She told me that when brother and I were very little dad would start yelling and we would just stand there and shake. Your blog will certainly help me navigate through some of the more difficult parts as I look for more tools to add to my toolbox. Thank you for your hard work and determination to help other victims of child abuse. Thank you so much for this. I feel and think all the things you write about when I get sucked back into the swampland. One of the hardest things is the sense of alone-ness there. Reading your post and the comments helps a lot: I feel part of a community of survivors – we will not be slain by the dragons and monsters of our past. We are resilient.